We love sparkles. We love slime. So it’s only natural that we’d love them together, right?! 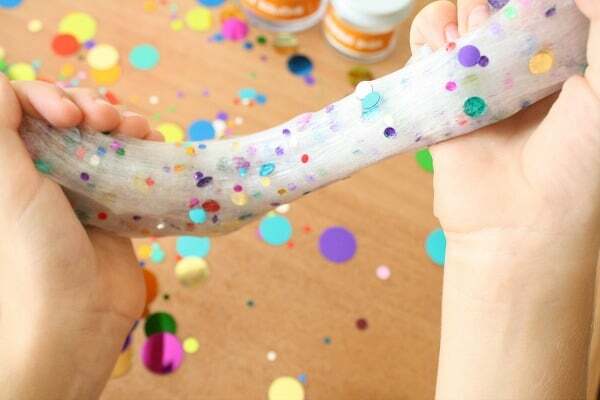 This sparkly confetti slime for kids is super quick to make, and there are a lot of fun ways to use it. We made it to share as part of our ongoing partnership with Elmer’s. Make it for your next birthday party, New Year’s Eve celebration, or just for fun! 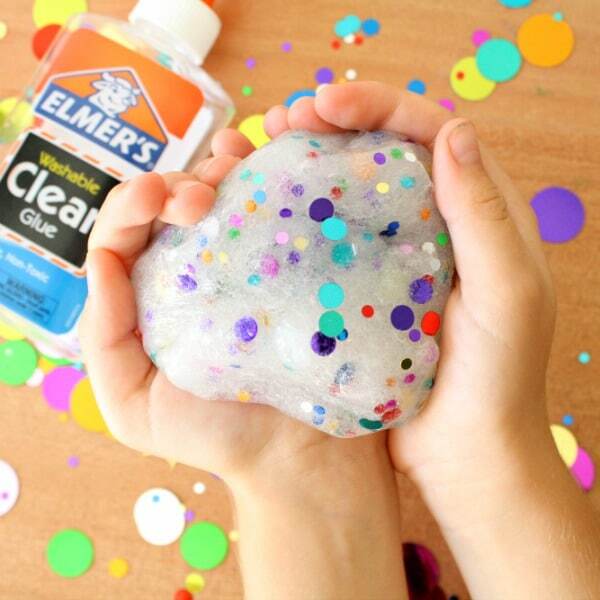 The Washable Clear Glue from Elmer’s is perfect for this slime. Because it’s clear the bright confetti gets to take center stage! 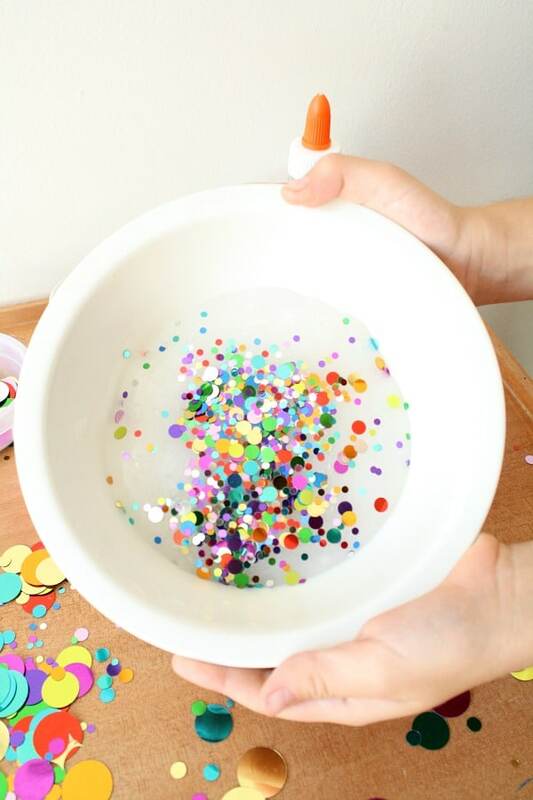 To make your own confetti slime, start by mixing up your favorite slime recipe. 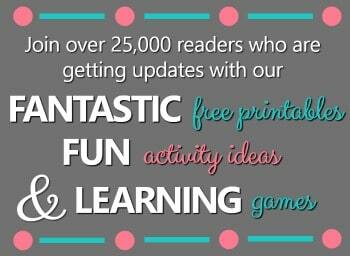 If you don’t have one yet, pop over to Elmer’s slime guide and check out all the recipe options there. 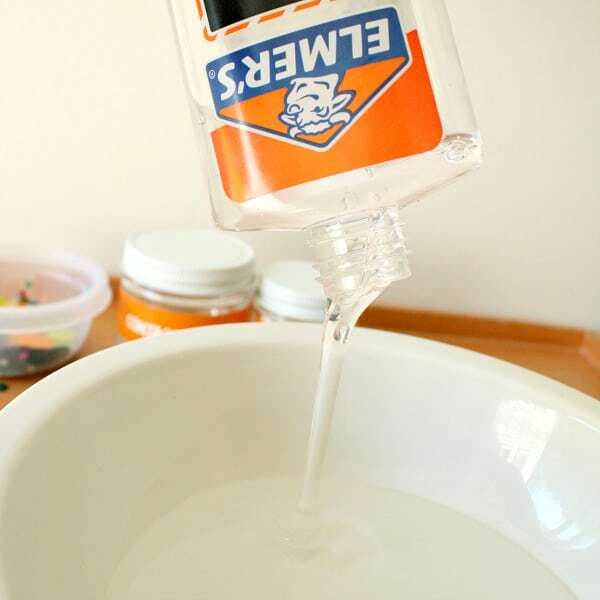 We used the basic recipe with washable clear glue, 1/2 Tbsp. of baking soda, 1 Tbsp. of contact solution. 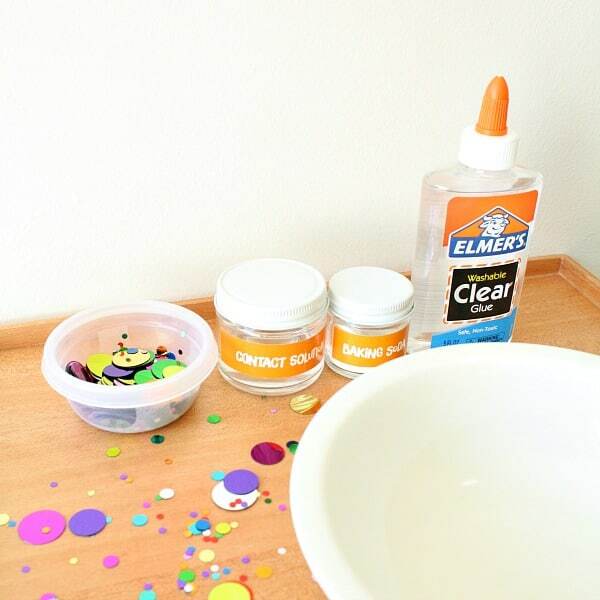 Elmer’s also has some great options for colored Glitter Glue if you want to mix up the color of your Confetti Slime a bit. Once you’ve combined the ingredients be sure to knead the slime well until you have the consistency that you like before adding confetti. If you have little ones helping you, let them add the sparkly confetti. They love to see the plain slime transform into a new sparkly version. We decided to save the larger confetti bits for other projects and only added the smaller ones to our slime. We thought they would mix into the slime better. As we sprinkled on the confetti we slowly separated the slime and watched the confetti ooze through the mixture. 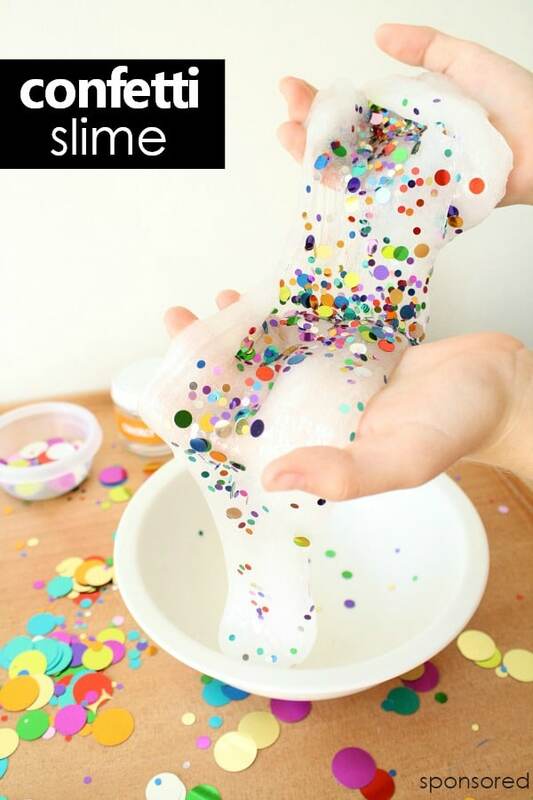 We love making slime anytime, but this version could also be used for special occasions. Give it out as birthday party favors. Mix up some of the plain slime. Add it to individual containers. Then set them out with small packets of confetti so kids can choose the confetti and slime of their choice. Make it for a New Year’s Celebration. 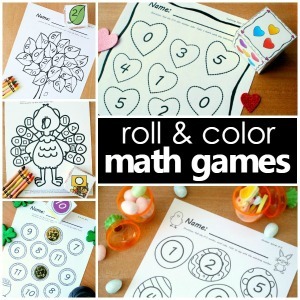 We love having fun activities for kids to do during family New Year’s Eve and New Year’s Day celebrations. 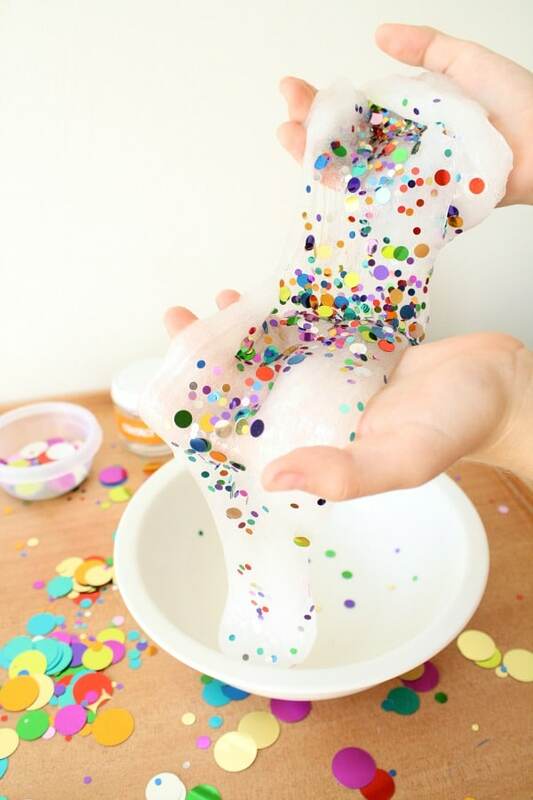 Mix up a batch of this confetti slime, and kids will have something fun to play with during the festivities. Mix up a batch of hot chocolate slime. Note: As with any play recipe supervise children closely. 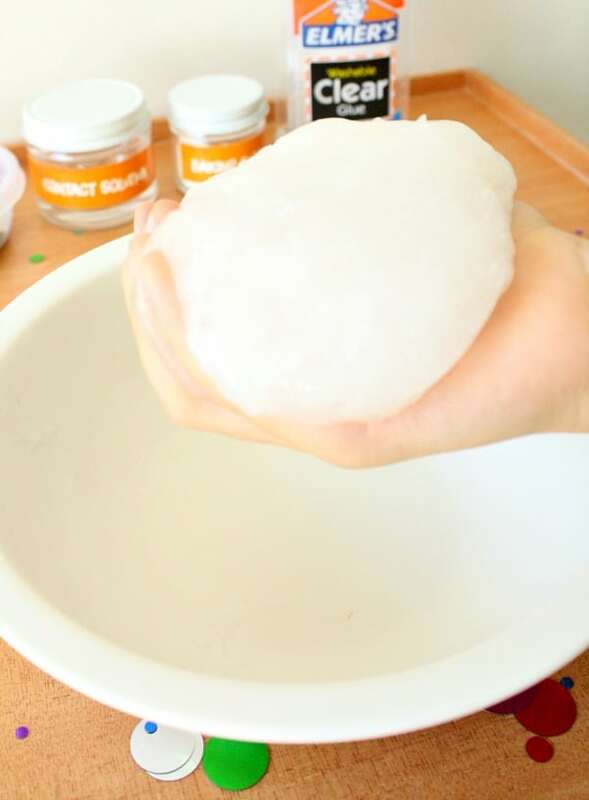 We have never had any skin or other irritations from playing with slime or this putty, but you are the best judge of what is best for your child. No part of this should be eaten. If kids have skin sensitivities test with care.